I'm feeling stripey today by twirling through the meatpacking district in the pattern I just cannot stop wearing (or buying) - black and white stripes! Hi all! I'm really excited to announce a new aspect that I will be adding to my blog from here on out - video (or vlogging, if you will). I have wanted to step into adding video elements to the blog for a while now and finally have the equipment and help to do so. So stay tuned for colorful videos coming soon to a blog near you! So I am a wee-bit nerdy and am certainly very type A. As a result, I'm obsessed with making (and sticking to) elaborate and detailed to do lists, and my planner - yes, I still keep a handwritten planner, is a work of art. As a result colorful, quality pens are very important to me! My mom and I have even been in a 5 year war over the "perfect pen" - its a random ball point pen that one of us probably stole from a doctors office (oops!). It writes so well that we continue to steal from each other whenever we have the chance, sneaky sneaky. Anyways, the 5 year fight finally came to an end when I let her take home the winning writer when she came to visit a few weeks bag. Why you may ask, because I received the cutest personalize package from Pilot Pen equipped with the most amazing pens to help me write in style! I'm so into colored shades at the moment, and these cool blue ray bans are to die for, plus I'm lusting for the Parisian inspired powder blue pillow from C.wonder - it would look great in my pink and blue bedroom that I can't wait to share with you! 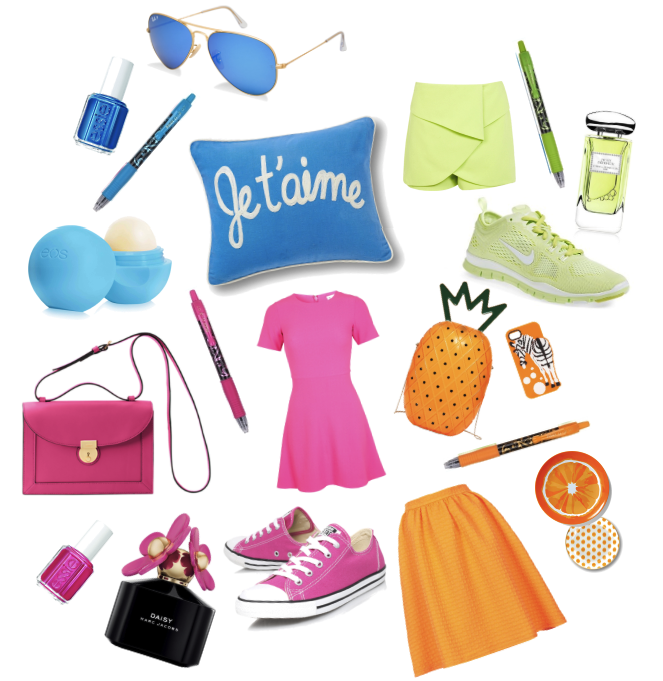 I'm loving this sweet and citrus inspired green hue, especially in skorts (my spring/summer go-to) and limey Nikes! I've been wearing converse and sneakers on replay, it's fun to switch things up with full dresses and girlie touches like pink hues or Marc Jacobs Daisy perfume. 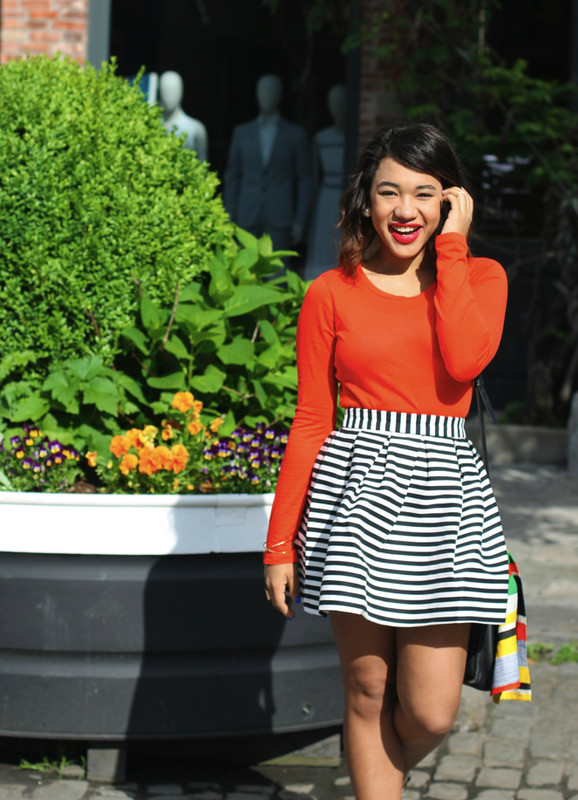 Back in the day I was all about orange, and this top shop skirt has me reverting back to my old ways - it's gorgeous!!! and who doesn't love a midi! OH and can we talk about this pineapple bag... Swoon! Oh Charlotte Olympia - you can do no wrong. Happy Wednesday, or should i say trends-day! 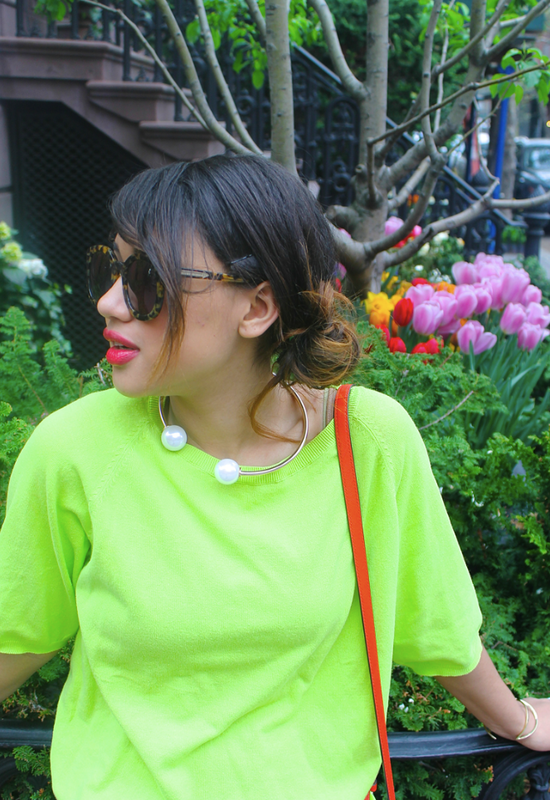 Today we're reviewing springs hottest trends and talking about how to reinvent them for summer! 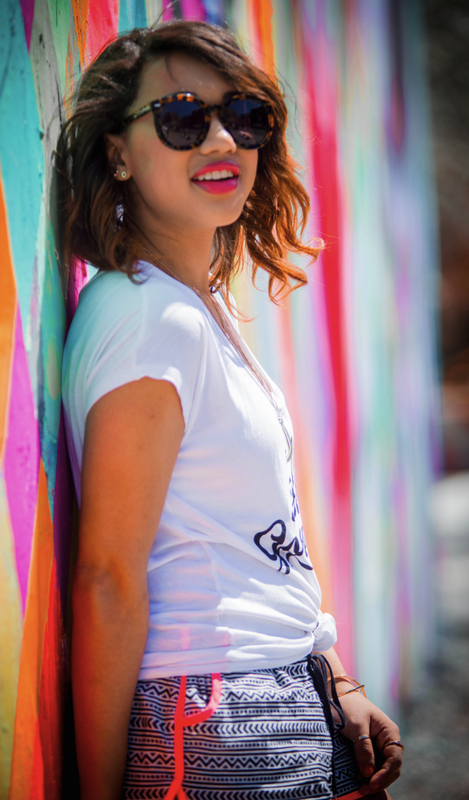 Sporty styles with an edgy twist were so hot this Spring. Jogger shorts, perforated leather and stylish slide ons worn with leather jackets or cool bombers helped give your gym gear a glamorous makeover! The sporty trend is perfect for summer weekend wear or even a mini vacay. 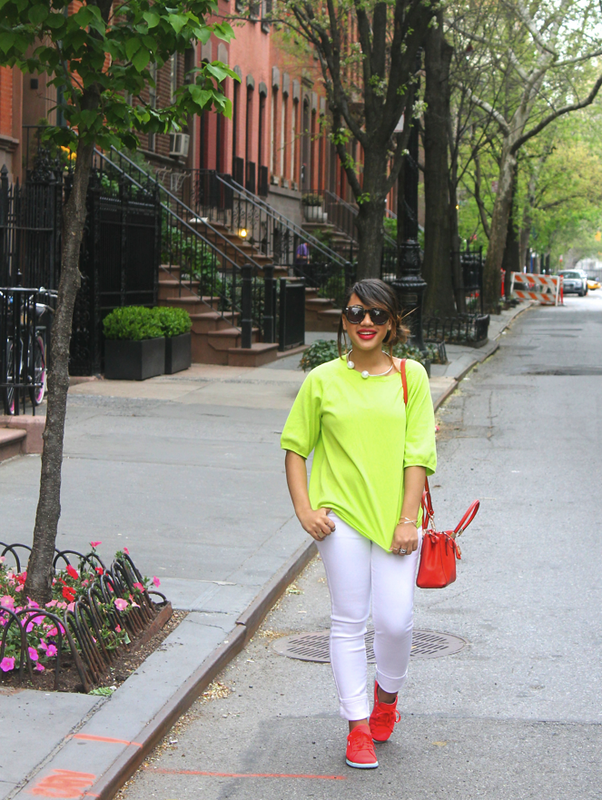 It’s easy, effortless and just downtown cool – plus, it’s great to have a trend that allows for sneakers and flats! Ditch your leather jacket and wear your jogger shorts, with a cool tee or button down blouse; or pair stylish slide ons and cool sneakers with a flirty summer dress for a fun twist on the trend. Crop tops are nothing new, but they aren’t just for the six-pack gym rats anymore! If you’re like me, and can’t put down the Cookie Dough Ice Cream (okay, now I’m hungry), or just want to wear this trend while being a little conservative, meet the high waisted skirt – your crop top’s new BFF. This perfect pairing with helps hide the hips, slim your waist and displays a smidge of midriff all while tackling this trend! 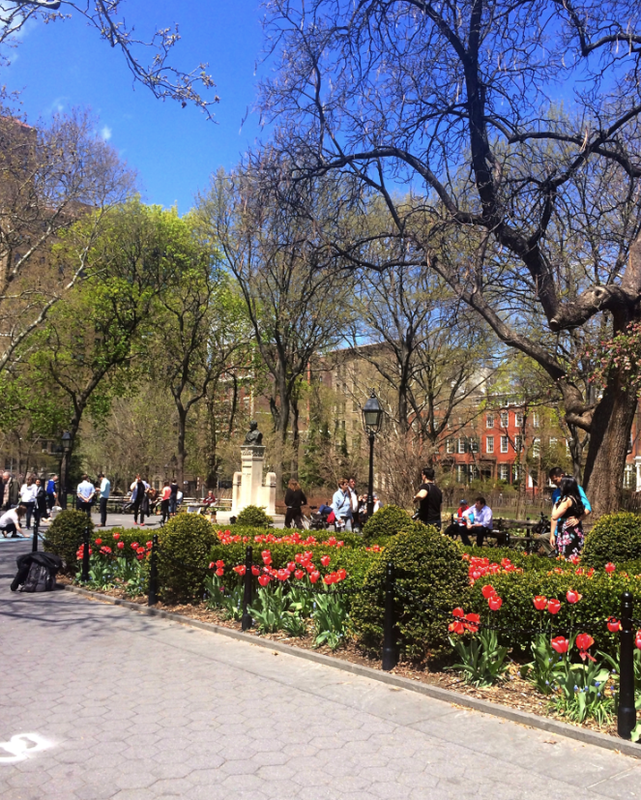 Today every things coming up roses … well daffodils? 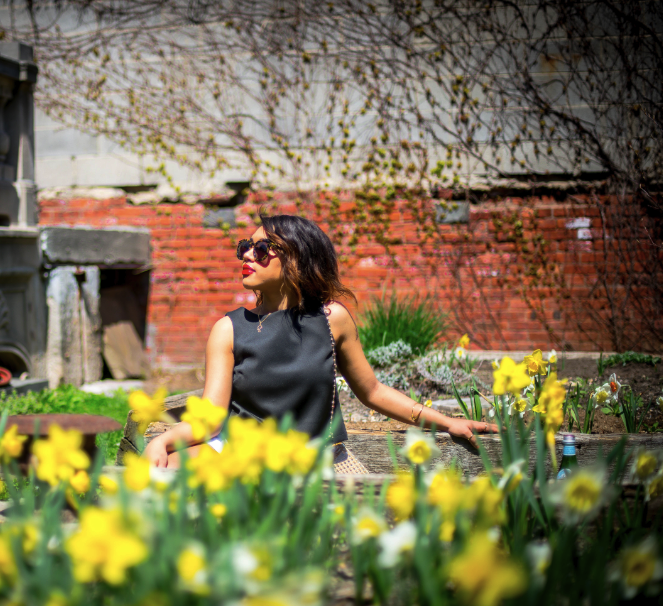 yes, i think those are daffodils - I'm really not sure, I don't know much about other flowers because I'm extremely loyal to peonies and sometimes dabble in gerber dasies… Anyways, every things coming up daffodils (or something) in my seemingly basic b&w look. But don't fret, there is an element of surprise under this striped trench … so stay tuned! I wore this look last night, when I stepped out to BucketFeet's pop up shop in Soho. BucketFeet is a super cool, unique show concept - all the shoes are playfully patterned and designed by different artists, each with their own unique style. Mine are designed by Miami based artist, Bad Panda, who drew inspiration from his home town to create my kicks. Today, Waffles and I are taking a walk on the bright side with contrasting highlighter hues and my new neon reebok skycapes! 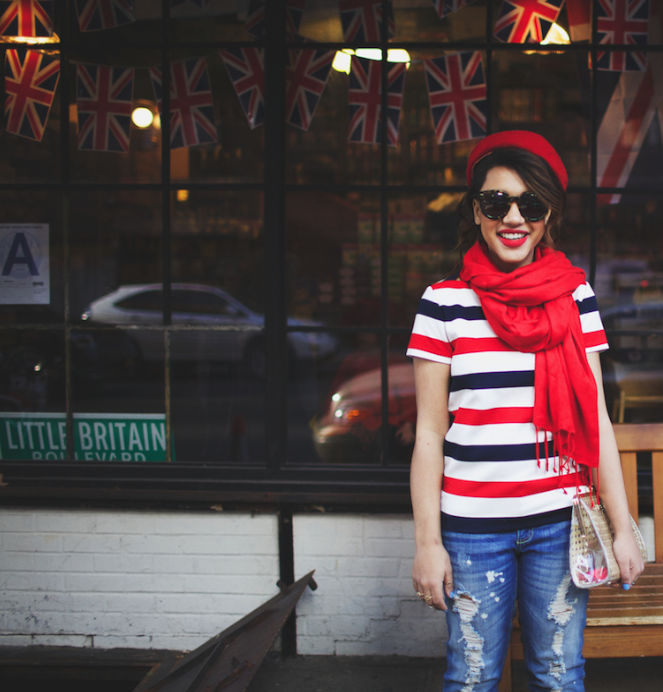 Parisian hat, Union Jack and very american ripped jeans… oh my! Spoiler alert - I may or may not also through up a super awesome peace sign (asian tourist style) at the bottom of the post…. please try to contain your excitement. as part of the Credit Insider's campaign towards spending responsibly. 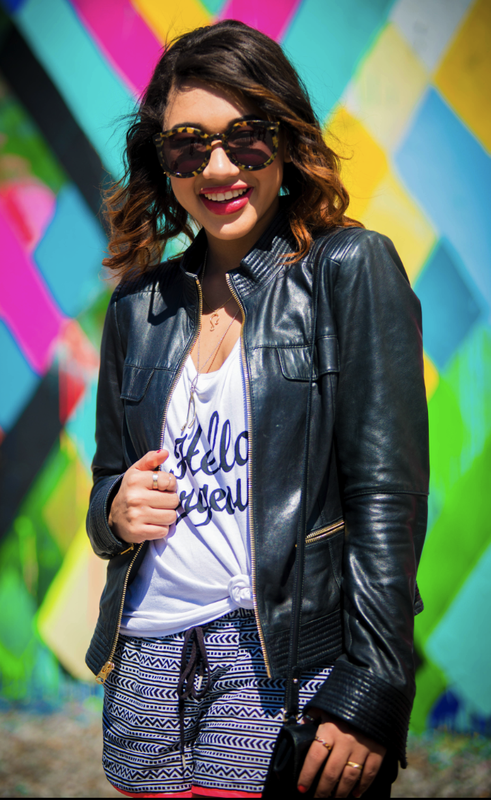 Pearly, girly styles and ulta-femme accesories are all the range for Spring - and I'm obsessed! But, no one does this trend better than the original pearl-master, Chanel. 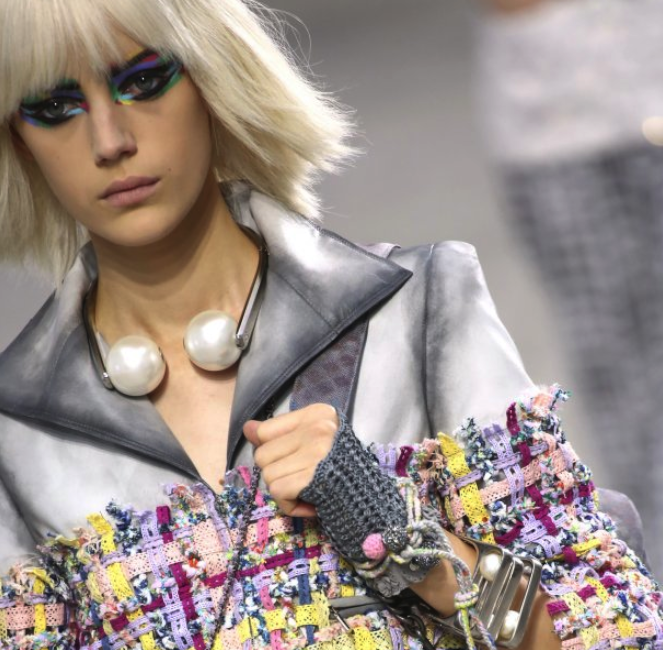 Chanel's spring collection had an artsy vibe, but nodded to it's pearl on pearl history with a headphone inspired giant pearl choker and pearly, bauble bracelets. Chanel can have an immobilizing affect on me, and this choker was not exception. I remember immediately having a "I want it… no, I need it!" reaction to this pretty, pearly number. In the words of Carrie Bradshaw, "It wasn't logic, It was love". I wasn't alone, Karl also shared my favoritism: "My Favorite thing is the new necklace like an earphone, it's two huge bears, but in fact it's very flattering because the huge pearls give a beautiful light on the girl's face"
Today I'm Overallin' … again! I dabble in the classics by pairing denim on denim with classic white and other neutrals. 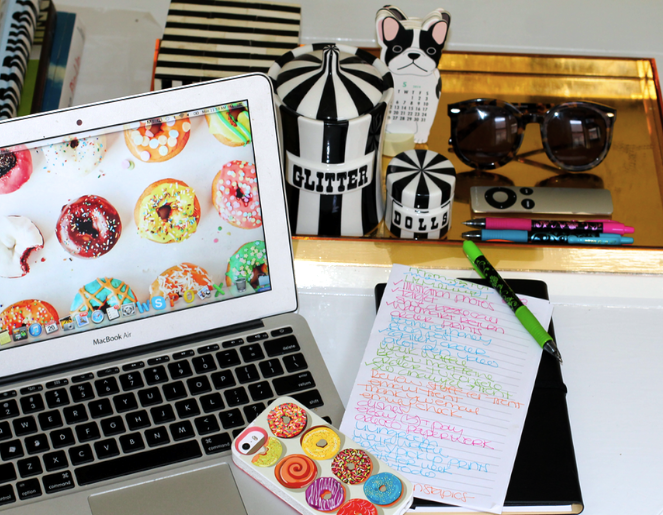 Happy Monday, dolls! 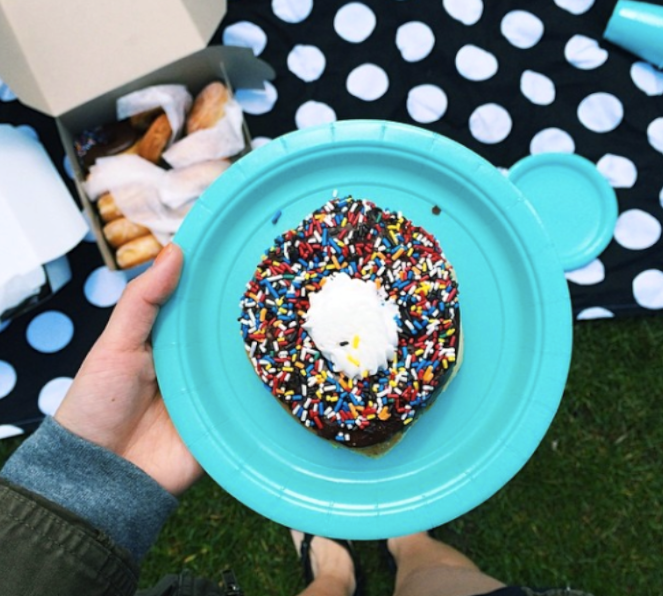 Hope everyone's weekend was pretty & perfect! 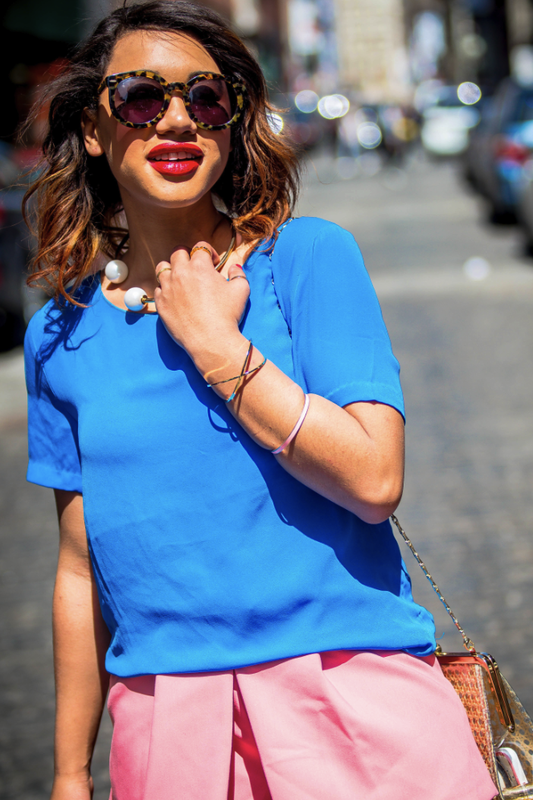 Today I was inspired by pink & blue, so I paired these two bright hues together for today's look! It's very rare that Casual Courtney makes an appearance in real life, let alone on the blog. 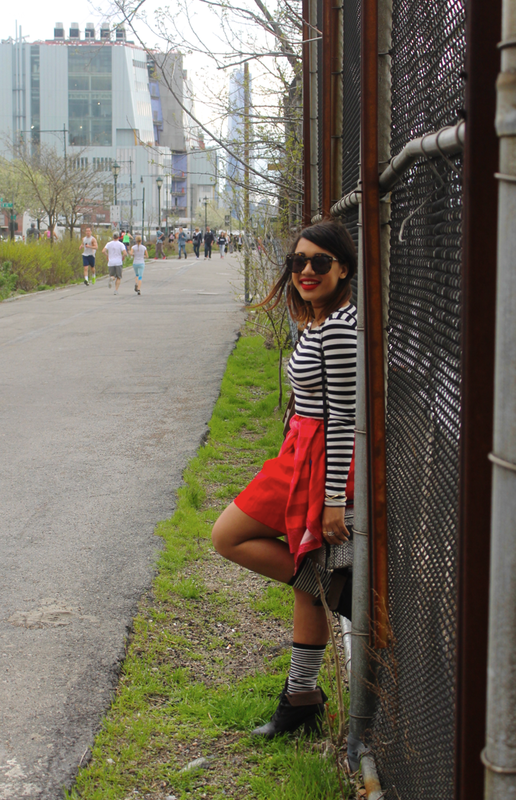 But with sporty spring styles being so on trend this season, I had to test them out. I feel so in love that, Casual Courtney has started to become my go-to weekend style. Paris isn't used to seeing me so casual and is still surprised when I pick sneakers over stilettos, and calls me Sporty Courty - hence the name of this post… thanks, Paris! 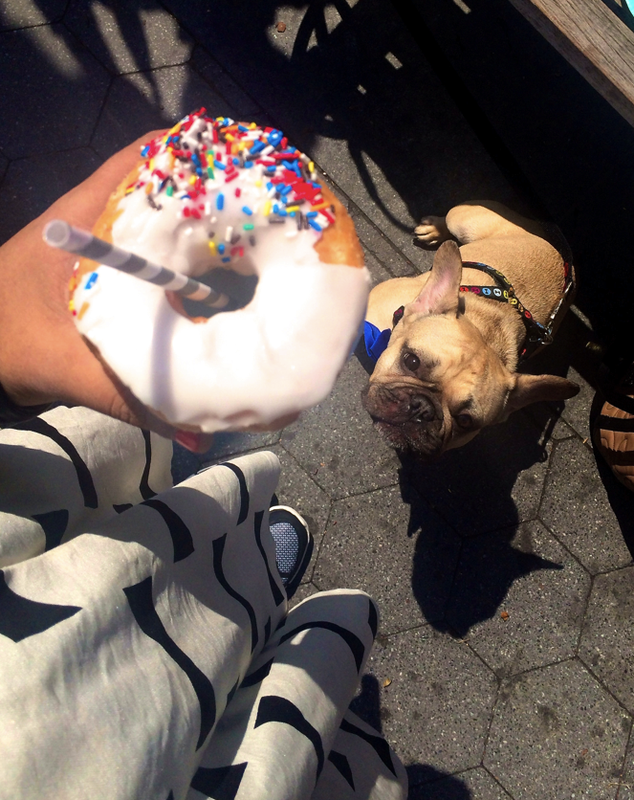 Donuts and Bowties and Bulldogs… Oh my! 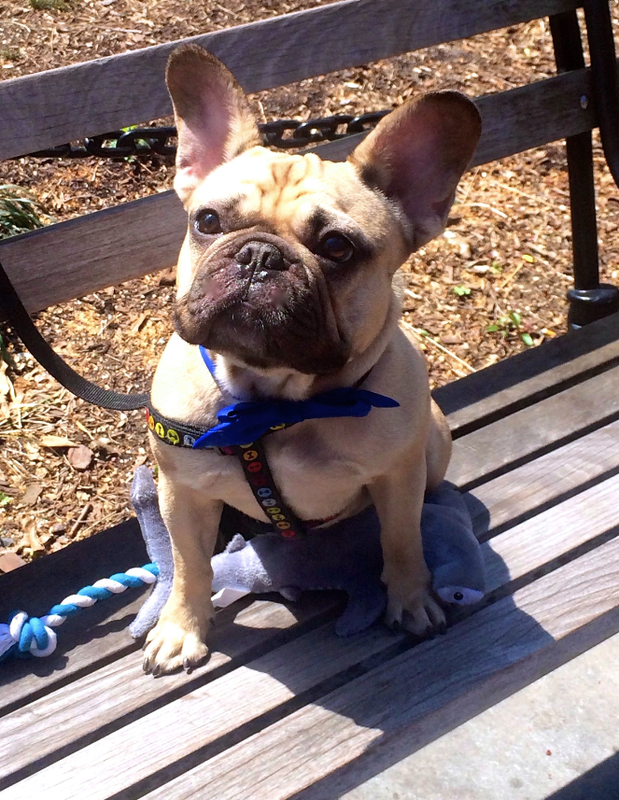 Today's post is going to be short & sweet, just like my little man. 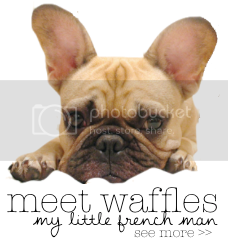 My french bulldog, Sir Waffles Leopold Nelson Fowler the 3rd, Waffles turned two last Tuesday! So in addition to flooding your Instagram feed with my favorite waffles pics on (follow along here) we also celebrated with a bow tie themed park party… Yes, I realize I'm ridiculous, don't judge me. Truthfully, we were partying too hard to cover the whole event, but we're able to snap a few of the highlights.